Monitor not included. Image does not reflect actual size. See dimensions below. 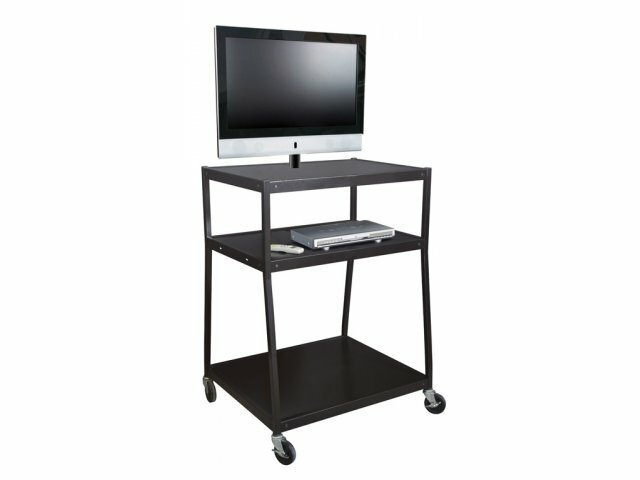 If you need to show video presentations on a flat panel monitor, then these wide-body flat panel monitor carts are ideal. 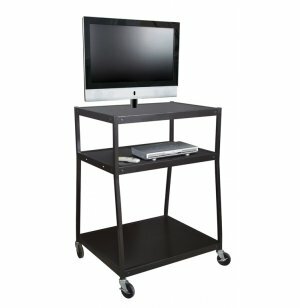 This unit is designed to accommodate flat panel TVs up to 37". The wider base offers greater stability and also lets you store larger equipment. Well-placed grommet holes through the two top shelves make it easy to manage cords between monitor, projector and speakers or video/DVD system. The easy-to-use universal mounting system means that anyone can hook up the monitor and start the presentation. This mounting system allows you to adjust the flat panel monitor to reduce glare and provide the best viewing angle. The cart is easy to move since it is mounted on 5" industrial grade swivel casters - two with locking brakes. Wider base adds greater stability and accommodates larger equipment. Top two shelves have grommet holes for cord management. Universal mounting system works with standard flat-panel monitors. Monitor angle can be adjusted to reduce glare and provide the best viewing angle. Middle shelf ideal for use with DVD and speakers. Four 5" industrial grade swivel casters - two with locking brakes.